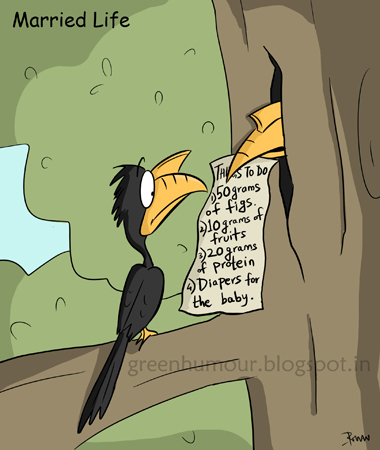 Hornbills have a rather bizarre way of breeding. The female locks itself up in a hollow of a tree trunk, that is sealed with a plaster of feces. She remains inside and lays eggs, incubates them, and feeds the chicks after the eggs hatch. After the chicks have attained a semi-dependent state, the female breaks open the seal and lets herself out. Throughout this period, the female and the chicks depend on the food supplies provided by the male, who is a loyal husband and a dedicated father.